The National Cycle Network (NCN) is the national cycling route network of the United Kingdom, which was established to encourage cycling throughout Britain, as well as for the purposes of bicycle touring. It was created by the charity Sustrans who were aided by a £42.5 million National Lottery grant. The 14,000 mile network was used for over 230 million trips in 2005. Little of the NCN is on dedicated bike paths. Though many routes try to minimise contact with motor traffic, 70% of them are on roads. The NCN uses pedestrian routes, disused railways, minor roads, canal towpaths and traffic-calmed routes in towns and cities. The opening of the Bristol and Bath Railway Path (now part of National Route 4) in 1984, a 15-mile cycleway following a railway no longer in use, was the first part of the NCN. The original goal was to create 5,000 miles (8,000 km) of signed cycle routes by 2005, with 50% of these not being on roads, and all of it being "suitable for an unsupervised twelve year old." By mid-2000, 5,000 miles (8,000 km) of route was signposted to an "interim" standard, and a new goal was then set to double that to 10,000 miles (16,000 km) by 2005. August 2005 saw the completion of that goal. As of August 2014, there were 14,700 miles (23,700 km) of signed cycle route to NCN standards. There are ten national NCN routes; these are numbered from 1 to 10. 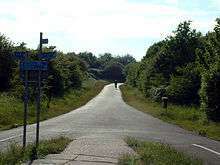 There are scores of regional NCN routes. Route 4: London (Greenwich) – St David's, in West Wales, via Reading, Bath, Bristol, Newport, Caerphilly, Pontypridd, Swansea and Llanelli. Route 10: Tynemouth — Cockermouth. Was regional route 10 Reivers Cycle Route. Return route for the C2C / Sea to Sea Cycle Route. Roughly parallel to the C2C and Hadrian's Cycleway. It is a branch of National Route 1. NCN routes beginning with numbers 1 to 6 are generally in England, the routes that begin with a 7 start in the far north of England and Scotland, with 8 are generally in Wales, and 9 in Northern Ireland. The main routes have one digit (1 to 6 radiate clockwise from the south of England); other routes have two digits, starting with the number of the relevant main route. There are also many regional routes, reaching smaller towns and cities within ten designated regions. Each region is divided into a maximum of nine areas. Regional route numbers comprise the area number 1 to 9 followed by another digit. (An exception is in the Scottish Borders council area, where regional routes are numbered 1 to 9.) This means that across the UK there could be 10 regional route 12s, for instance, as well as the national route 12. To reduce confusion, identically numbered areas in adjacent regions do not abut, and routes with the same number are widely separated. In 2009 regional routes were being renumbered with 3-digit national numbers. Routes are occasionally numbered to match the motorways and major roads that connect the same destinations; examples include NCN Route 62, which by connecting the two sides of the Pennines mirrors the M62 motorway. The network is signposted using a white bicycle symbol on a blue background, with a white route number in an inset box, but with no destination names or distances. National Route numbers have a red background, Regional Route numbers have a blue background. The system of symbols is based on that used by the Danish National Cycle Route network. One thousand "Millennium Mileposts" made from cast iron were funded by the Royal Bank of Scotland to mark the creation of the National Cycle Network, and these are found along the NCN routes throughout the UK. There are four different types: "Fossil Tree" (designed by John Mills), "The Cockerill" (designed by Iain McColl), "Rowe Type" (designed by Andrew Rowe), and "Tracks" (designed by David Dudgeon). The four artists are from each country of the UK, though all posts can be found in all four countries. Most mileposts contain a disk featuring symbols and text in code. There are 60 different designs, spread across the country. They form part of the Millennium Time Trail, a treasure hunt puzzle created by Sustrans in 2001. ↑ "National Cycle Network". Essex Council. 2012. Retrieved 2012-09-24. 1 2 Hesdin, Farah (2011-11-29). 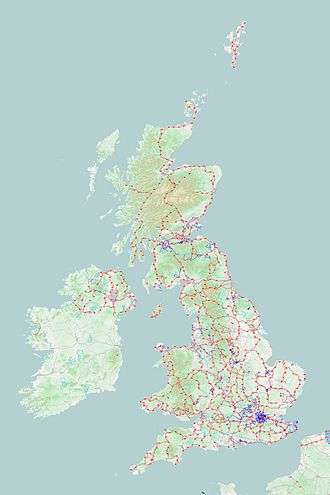 "The UK on a bicycle: the National Cycle Network". Bikenet.com. Retrieved 2012-09-24. ↑ "About the National Cycle Network". Sustrans. Retrieved 7 August 2014. ↑ "Route numbering system". Sustrans website. Sustrans. Retrieved 12 December 2013. 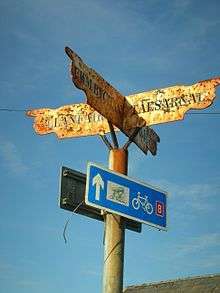 ↑ "National Cycle Network Mileposts". Geograph Britain and Ireland website. Retrieved 12 December 2013. ↑ "National Cycle Network - Art - Mileposts". Sustrans website. Sustrans. Retrieved 12 December 2013. ↑ "Secrets of the Millennium Time Trail". Secrets of the Millennium Time Trail website. Retrieved 23 August 2015. Sustrans, 2002. The Official Guide To The National Cycle Network, 2nd ed. Italy: Canile & Turin. ISBN 1-901389-35-9. Wikimedia Commons has media related to National Cycle Network.